I was a big fan of the Green Arrow, going way back to The Brave and the Bold, Mike Grell’s run on the Emerald Archer and his graphic novel, Green Arrow: The Longbow Hunters. Back when he was the socially concerned liberal hero rather than the techno-saavy CEO millionaire as he was portrayed in DC’s New 52 line in 2011. It was good to see the character return to his old form as part of DC’s Rebirth line. In “The Inferno”, the story picks up with Green Arrow and Diggle making their way towards the villain’s sea-going vessel, The Inferno. Black Canary, captured last issue by the ninjas, Shado and Emiko is menaced by the disfigured Dante, leader of the Ninth Circle, a sort of Parliament of Owls conglomerate but with horribly burned faces and bizarre masks. Black Canary has returned as a romantic interest of Green Arrow. Good for long-time fans since she was barely an acquaintance of Oliver Queen in the New 52. The question of good and evil is explored as well without taking sides on the subject by both Dante and Green Arrow. 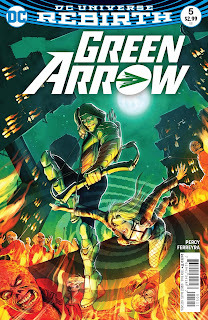 This issue, though action packed with chock with more than a few surprises, is really a turning point for Oliver Queen. What is important to the persona of Green Arrow/Oliver Queen? What makes him the man that he is? The final page directs the story in an unexpected turn. The verdict: This issue has been beautifully drawn and colored by artist, Juan Ferreyra with nice sequencing and panel design. Writer Benjamin Percy keeps the book fresh and interesting with a new villain added to Oliver Queen’s rogue’s gallery. 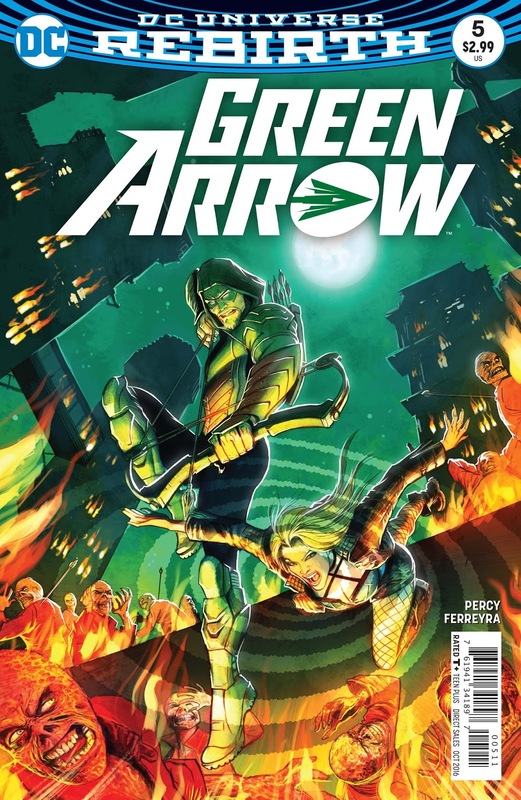 Green Arrow has been a popular title within the Rebirth line and with this latest effort, ensures it will remain so.